Grab your supplies. You may already have a hamper, trash can, or toy box in your room. Use the list below to gather the things you need to clean your room. Don't begin cleaning until you have all of your supplies in your room. Trying to find supplies one at a time is a waste of time. Grab all dirty clothing and put it in a hamper.I know the dirty clothes in your room are probably near the hamper, but we want to actually put them in the hamper. Don't worry about unfolding your socks or turning clothes right side out. We'll do that when we sort out the laundry. Grab all trash and put it in the trash can. Don't worry about anything but trash right now. Pick up all the obvious trash and throw it in the can. Make the bed. If making the bed seems like a waste of time, humor me. Smooth out the sheets. Smooth out the blanket or comforter. Fluff your pillows. Stand back and take a quick look at the bed. It looks much neater, not necessarily better, just neater. On the plus side, you're not as likely to loose things in your bed when it's neat. Grab all the clean clothes and refold or rehang.This is where that made bed comes in handy. If you have a lot of clothes to refold or rehang you can neatly stack them on your bed to remind you to fold them later. This saves you a little time now, keeps the room looking neat, and makes sure you will be reminded to fold them before trying to crawl into bed. 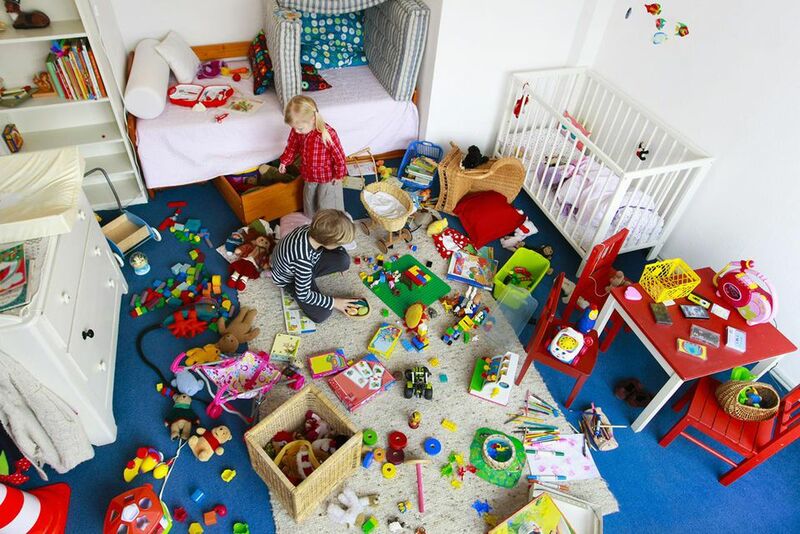 Pickup all the toys from the floor, bed, desk, etc.Put them into a toybox, petnet, or wherever they belong. Don't worry about sorting out what toy goes with what piece, etc. Just put them all into the box. Pickup all the items that don't belong in the room and place them in a basket, box, or bag.We're not worrying about placing the items where they belong right now. Just put them all in a basket for now. Sweep and mop, or vacuum.Don't worry about moving furniture to do this. Put away all of your supplies.That's it. You're done. Does it look like a place you'd actually like to live in? If you have a few minutes leftover after vacuuming, older children can grab the basket and take the items in it to their proper area. With younger children, have them put the basket in the hall for an adult to sort through later. Be careful about leaving the items in the basket. Very soon, you’ll find that the basket is overflowing from your mini-cleanup times. You’ll still have to sort and organize weekly. Yes, I know that doesn't seem fair. Model the efforts with a young child's help every day for a week to get them used to the new cleanup method. Make a picture chart for young children to allow them to see the steps they need to go through. Consider a visual reward chart using stickers to show that the kids have down their cleanup each day.